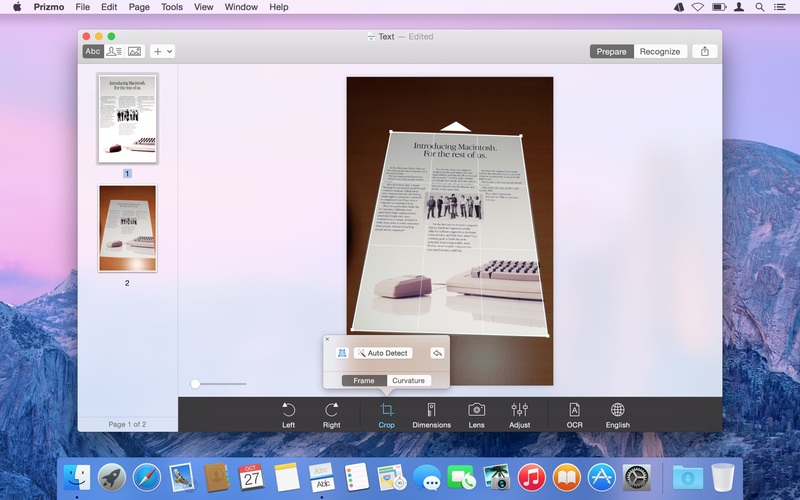 Prizmo 3 is a revolutionary scanning application with optical character recognition (OCR) in over 40 languages with powerful editing capability, text-to-speech, and iCloud support. State-of-the-art OCR technology in 40 Languages: Afrikaans, Albanian, Basque, Belarusian, Bulgarian, Catalan, Croatian, Czech, Danish, Dutch, English, Esperanto, Estonian, Finnish, French, Galician, German, Hebrew, Hungarian, Icelandic, Indonesian, Italian, Korean, Latvian, Lithuanian, Macedonian, Malay, Norwegian, Polish, Portuguese, Romanian, Russian, Serbian, Slovak, Slovenian, Spanish, Swahili, Swedish, Turkish, Ukrainian, and Vietnamese. Output formats: image files (JPEG, PNG, TIFF), and text files (PDF with Spotlight-searchable text, RTF, TXT) – even multipage! Enhanced for the Retina display.